Since 2015 Australians have been talking about home battery storage being on the cusp of financial viability. Are home batteries worth the investment in 2019? We’ve crunched the number for all of Australia’s capital cities to find out. This article was originally published in February 2017. We then had an August 2017 update, followed by an update in Jan 2018 and now again in April 2019 to take into account changing grid electricity prices, solar feed-in tariff rates, battery installation prices and solar PV system installation prices. For regular updates, check out our monthly Battery Storage Price Index. Previously we’ve looked at the topic of when battery storage will become a ‘no-brainer’ investment. In that article, we said that the ultimate goal post is the point at which the addition of batteries actually reduces the payback period of a solar PV system – rather than lengthening it. 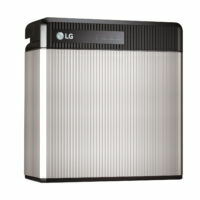 If we assume that the batteries are charged only with the sun, by our estimates battery storage pricing needs to come down to about $200-$300 per kilowatt-hour (kWh) of storage capacity (for a lithium battery with a 10-year warranty) for it to make sense purely from an investment standpoint. Paybacks could be faster if tactics like tariff arbitrage, selective energy export and spot price trading are implemented. 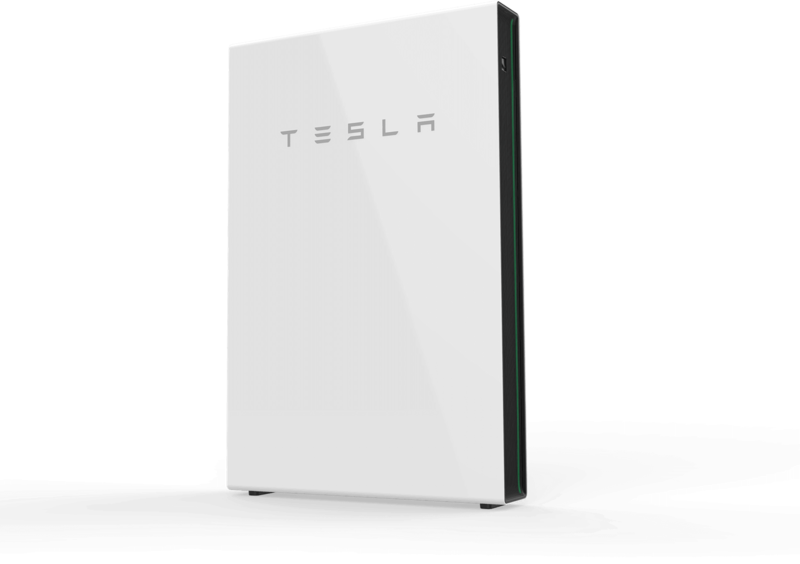 Currently, the lowest prices we’re seeing are about $500-$600/kWh of storage capacity. We’re getting closer to this much anticipated price milestone, so for the time being we’re mainly looking at whether a solar & battery system will pay for itself before the battery warranty expires – breaking even. Please note that throughout this article we refer to solar & battery storage systems as ‘whole’ or ‘battery only’ systems. In fact, the vast majority of the value delivered comes from the solar PV portion of the system, not the batteries. Solar PV systems (without batteries) generally have payback periods as low as 2-5 years depending on the situation; because batteries deliver less value and cost more, adding them to a solar system will inevitably lengthen the payback period for the system as a whole. If your primary goals are greater energy independence and reduced electricity bills, then batteries can help you achieve them – but batteries on their own may not always be fantastic from an investment point of view. While the batteries will almost definitely continue to perform after the warranty has expired, you’ve got no concrete assurances that they will. Also keep in mind that a battery’s performance may be diminished at the end of the warranty term (read about battery ‘end of life’). We therefore suggest that anyone intent on getting batteries should at least aim for a system that will break even over its 10-year warranty period – or better yet, offer an attractive return. 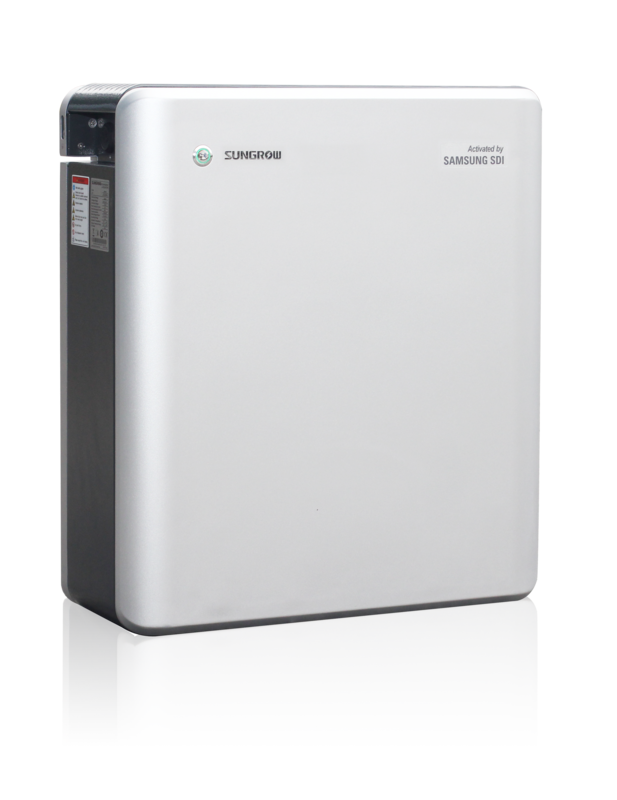 Whether simply breaking even within the warranty term is ‘worth it’ is a subjective question, but the growing uptake of home battery storage systems indicates that – for many people – it is. 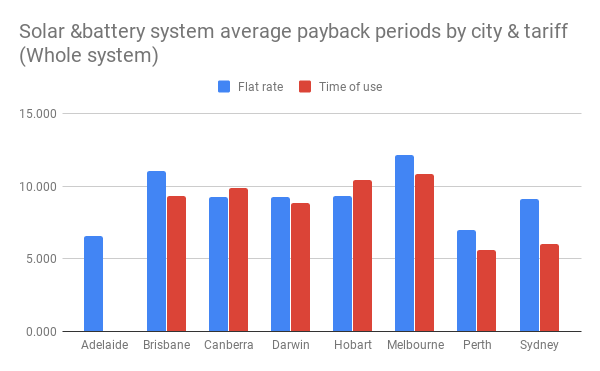 Using our Solar & Battery Storage Sizing & Payback Estimator, we created scenarios for all of Australia’s capital cities, assuming that the home in question uses 25kWh of energy per day on the ‘evening peak’ usage pattern for weekdays and the ‘day focus’ pattern for weekends – common for households with 2 working adults and school-age children. Electricity rates by capital city, based on most competitive plans available on EnergyMadeEasy.gov.au. 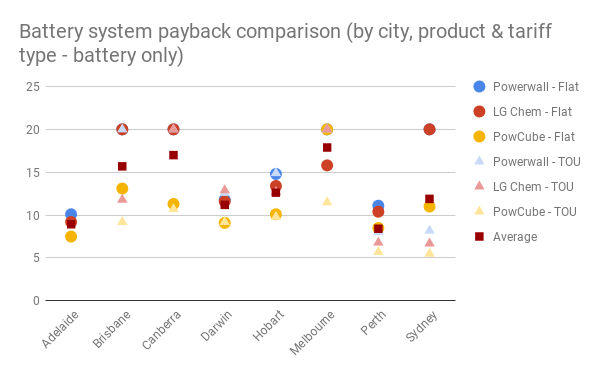 We then plugged in average solar system prices from our August 2018 Solar PV Price Index for each capital city using 5kW for all scenarios (plus an additional $1,000 on the solar system cost for ‘battery-ready’/hybrid inverter). For the ‘small’ battery system, we used SunGrow’s PowCube, which has a usable storage capacity of 4.5kWh. We set battery degradation in accordance with the manufacturer’s specifications for each product (70% retained capacity at end of life for Powerwall & Powcube, and 60% for RESU10). We’ve also ignored most of the auxiliary benefits that batteries promise: Tariff arbitrage (for TOU customers) and compensation for exporting stored energy with systems like selective export programs like Reposit’s GridCredits. 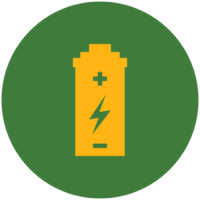 These benefits will have a positive impact on battery payback times where they are available. 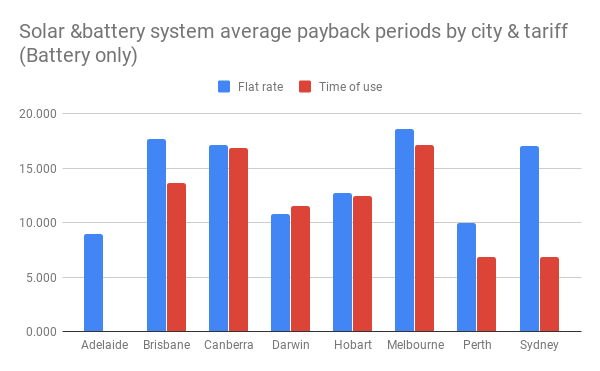 We haven’t taken into account incentives for battery storage available in Adelaide and Canberra. 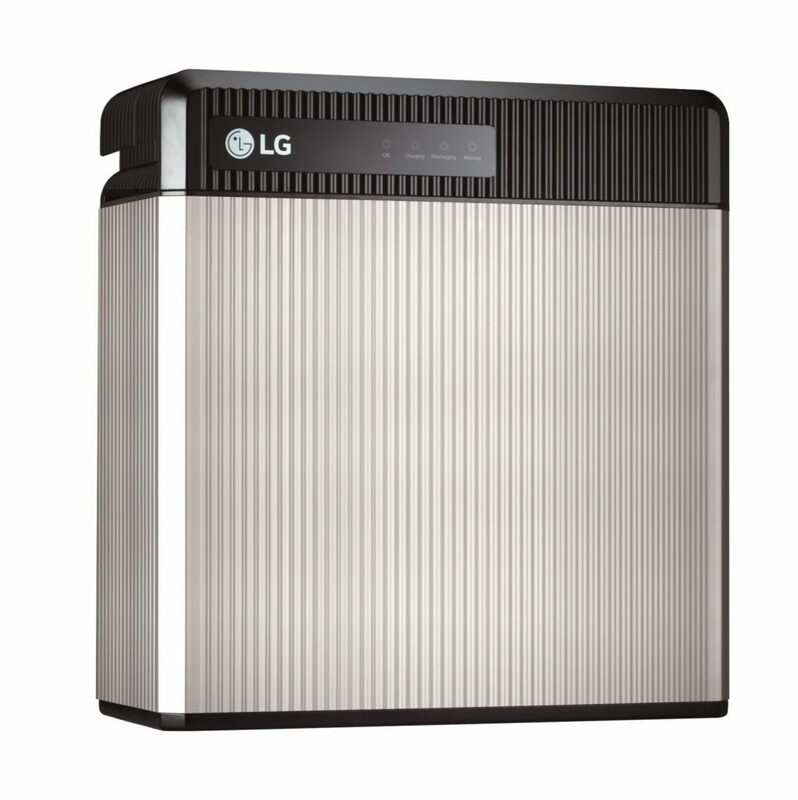 We assumed that each battery system would retain the same price tag regardless of the city where it was installed. Also note that throughout this article we have not taken into account the cost of finance, instead assuming that solar & battery system purchasers pay for their systems out-of-pocket. We’ve created the the following tables so anyone can quickly work out whether battery storage may be worthwhile for them – and if so, what size battery bank will offer the best returns. The first two tables below sum up the results in one place (hover cursor to see numbers), while the following sections show the results in more detail. 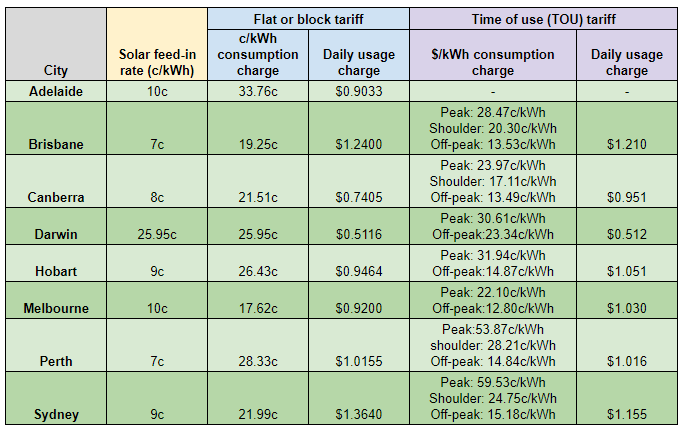 Results for Darwin are not included because the high feed-in tariff rate on offer there means that installing battery storage actually results in an increase in energy bills (vs solar alone). Read more in-depth city-by-city analysis in this article. 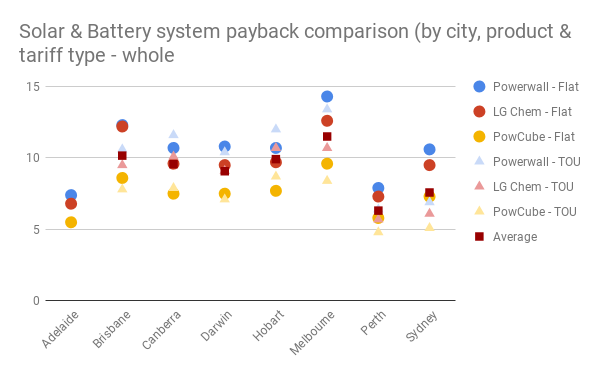 Estimated solar & battery system payback periods by capital city and tariff type. Note that payback periods for solar only systems will be shorter in all instances, as the ‘solar’ component of the system provides most of the value. Ready to shop for solar & batteries? Compare solar & battery quotes from installers in your area. Rigorous study with few holes that continues to demonstrate that money spent on batteries instead of panels is wasted. The same money spent on panels can result in a credit each quarter cutting payback periods for the panels to just a few years. As an example I have a reasonably inefficient 10KW system that is seven years old, use about 11KWh a day, try to organise pool pump, dishwasher, washing machine etc to run when electricity is being generated, have a time of use meter, rooftop solar hot water which is not boosted 95% of the time and pay a ridiculous 1.45 (approx) daily charge. Each quarter I receive a refund of between 150 and 300 from a fit of 20c. If I had spent 1/2 the money on batteries I would be paying each quarter. The only logical argument, in the current climate, for installing batteries is to be independent of the grid. Thanks for your feedback and great to hear your system is working for you. We indeed highlight that solar alone as an investment has much quicker payback periods. Take in mind what works for you will not be the case for everybody, as everyone’s energy consumption is very different. For starters we have seen many situations where grid connect systems have gone ahead with battery storage, mainly due to a high night time consumption pattern. Also, as you have had your system for many years you are receiving a very attractive feed in tariff, which would not be the case for people installing a solar alone system in 2019.